Without an online planner to keep me organized, my life could quite possibly be in complete disarray. If you are like me, then keeping organized may be the only thing that is keeping your head above water. Finding an online planner that worked for my family wasn’t easy, but when I found one that actually worked it was truly a lifesaver. Flying by the seat of your pants when trying to keep your home “together”, just doesn’t seem to work in the long haul. Even the most organized person can easily fall into a hay ball of chaos throughout the month and wonder where time has gone. I remember a time in life when my homeschool and home life was literally a blur. My memory of those days was like a cloud of chaos; like when cartoon characters get into a scuffle and all you can see are hands and feet popping out of a cloud of smoke. I know that seems like an exaggeration, but in the midst of my unorganized life, it truly felt like that. I wonder how I was able to even function. If this sounds familiar, then maybe this is the year you let an online planner be your lifesaver as well. Anytime is a good time to start using an online planner, but why not start today?! Once you get started you will wonder why you didn’t start a long time ago. When I learned all about Homeschool Planet’s multi-purpose online planner, and there was no turning back. 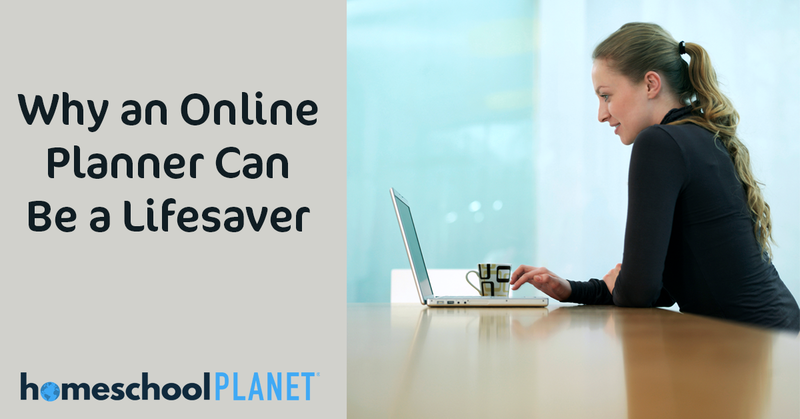 Check out these reasons why Homeschool Planet was a lifesaver for my family and why it will do the same for you. It is easy to find yourself wrapped up in a super busy week, and let your to-do list pile up with not a thing to checked off. My online planner helps me to remember what is due and when, what my deadlines are, and what I need to do next in my housework, work, and family. Reminders can be sent to each family member individually. My kids even send me reminders. “Mom, don’t forget about our movie date!” They keep me on my toes. Plans change and an online planner helps us roll with those changes seamlessly. How many times have you been out and about running errands or at a doctor’s appointment, when you need to write something down, set-up a reminder, or even learn you have missed a deadline? An online planner follows us anywhere that has an internet connection to update and edit as many times as we’d like. I decided to start a work-at-home business. As if my life wasn’t complicated enough! My family needed an extra income and I knew I was able to help provide it. Yet, how would I homeschool, run my household, AND work from home? I was using the best homeschool planner online ever already with my kids. It kept them on schedule and sent them reminders on when their assignments were due. 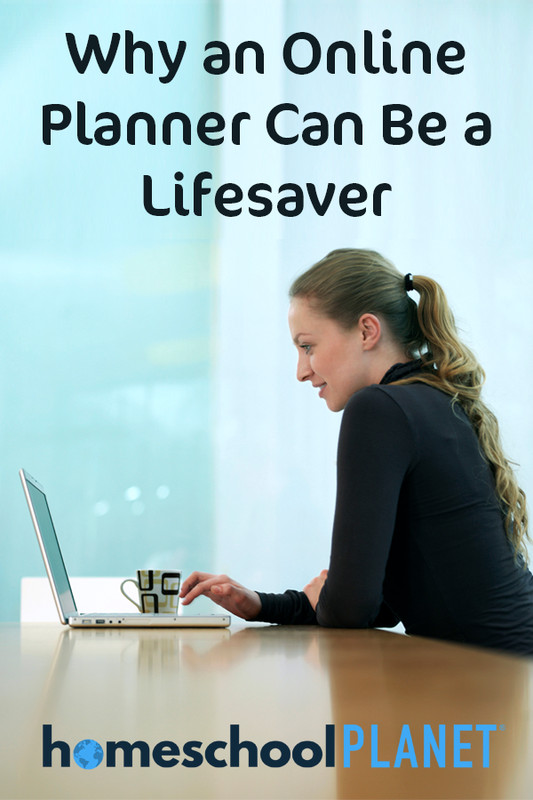 I soon found that I could organize my home schedule of appointments, set daily chore schedules, and all while using the online planner for work deadlines and tasks. This online planner literally kept me in line, when I needed it the most. I go through times when I just don’t believe in myself. I deter myself from moving to the next level in my business or I get discouraged when trying to homeschool my kids. I doubt I am good enough to handle it all, and on my own, I couldn’t handle it all. Yet, my online planner helps me to stay focused and reach my goals. I am able to take notes on spur of the moment ideas, make reminders to research how to grow my business, and when to make time for fun with my kids. I needed something to keep me on track and to motivate me not to give up. Homeschool Planet’s planner online helped me to send messages to my kids for encouragement and to tell them I love them a few extra times throughout the day. I honestly was running on empty. Every day felt as if time was getting shorter and shorter. Until I was able to get my life in order, it seemed as though time was literally slipping away. Homeschool Planet’s planner online was able to keep me on target for daily routines, homeschool, and now my work. The last piece of the puzzle was making time for self-care. Moms tend to put themselves on the back burner. Yet, when mom is stressed, everything in the home is affected. Homeschool Planet’s customizable planner has allowed me to schedule in some much needed ME time and my family sees the difference it has mad. It is healthy to set time aside to take care of the earthly temple given to us. Organization brings me joy. Even in a life full of trials and struggles, being able to have order in my home really helps me feel at ease. I am so grateful to have found an online organization tool to help keep my life together. I honestly don’t know how I could have made it without it. Homeschool Planet was exactly what I needed to keep my head above water. Do you need a lifesaver in your home too? Homeschool Planet’s Lesson Market Place and homeschool planner online can help!